Several golfers took part in the Winner Regional Foundation golf tournament held Aug. 4 at Winner Country Club. Champions of the second flight were Keith, Kari and Lynn DeMers and Chuck Keiser. Second place in this flight went to Rick and Deb Godel, Terami Nespor and Michelle Lovejoy. 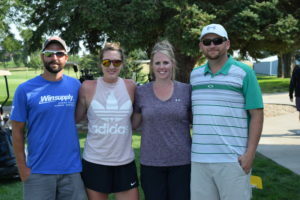 Winning the third flight were Stormy, Melissa and Ryder Halligan and Ty VandenHoek. Second place went to Jason and Tovi Bartels, Jamie and Kevin Keiser.